Word cloud highlighting Healthy & Vibrant Communities feedback collected during the Town Hall Meeting on Aug. 29, 2016. 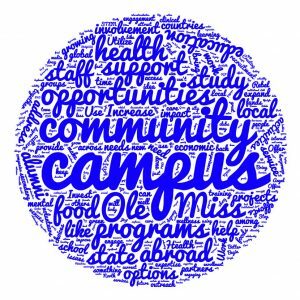 Through community engagement and service, the University of Mississippi touches lives and communities from across the street to across the globe. The University of Mississippi Medical Center, the state’s only academic medical center, sees more than one million patients each year and is helping to save lives and improve the overall quality of life in our state. The university also has a transformative role on the economic status of our communities, working with start-up companies that license UM-created technologies. Scholarly engagement brings the creativity of our faculty, staff, and students to our partner communities across the state, nation, and world to solve important problems of the day. All these endeavors and successes reflect our deep commitment to serving others and reinforce our flagship status — we are transforming lives, communities, and the world. During the 2016 Town Hall, we received 115 ideas about healthy and vibrant communities across the following 11 broad categories. Click on each category to read all the individual ideas submitted by UM community Town Hall participants.